2015 Arctic Cat 90. Picture credits - Arctic Cat. Submit more pictures. Young riders love the power of our 90cc engine. 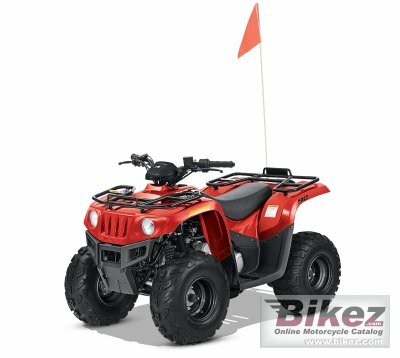 It�s an air-cooled, single-overhead-cam, 2-valve 4-stroke, meaning it�s clean, quiet and fuel-efficient. The 90 Utility and DVX� 90 machines feature a 15 mph speed limiter. Wheels: Powder-coated steel wheels. Kenda tires. Comments: Headlights and taillight. Safety Flag. Ask questions Join the 15 Arctic Cat 90 discussion group or the general Arctic Cat discussion group. Bikez.com has a discussion group for every motorcycle. Here you may find answers to common questions about the model. If you do not find what you are looking for, you can ask questions. Try out the 2015 Arctic Cat 90 discussion forum. You can sign up for e-mail notifications when other users answer you. If you have information about any technical issue related to this motorcycle, please leave a comment for other riders.